Headquartered in downtown Los Angeles, Preferred Bank has 12 full-service branches with ATMs available in California and one branch in Flushing, New York. Its small business offerings include business savings and checking, business loans, treasury management and investment solutions. It is rated five stars on Bankrate. Preferred Bank is headquartered in downtown Los Angeles, along with 11 full-service branch banking offices in the California cities of Alhambra, Century City, City of Industry, Torrance, Arcadia, Irvine, Diamond Bar, Pico Rivera, Tarzana and San Francisco, and one office in Flushing, New York. You can use its branch locator to see what locations are closest to you. 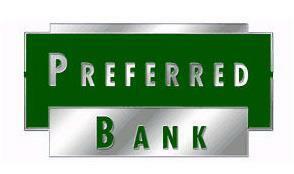 Preferred Bank also offers the following business services: business savings and money market accounts and business line of credit as well as business loans, Small Business Administration loans and commercial real estate loans. Although it offers business debit cards, it doesn’t offer business credit cards or wealth management. Find out more about its small business offerings on its website.